When Mercury underwent a major company rebrand three years ago it wasn’t just their logo and identity they wanted to address. They needed to make sure they united the staff, too. The new Mercury building in Newmarket was purpose-built to bring together three separate Auckland offices. 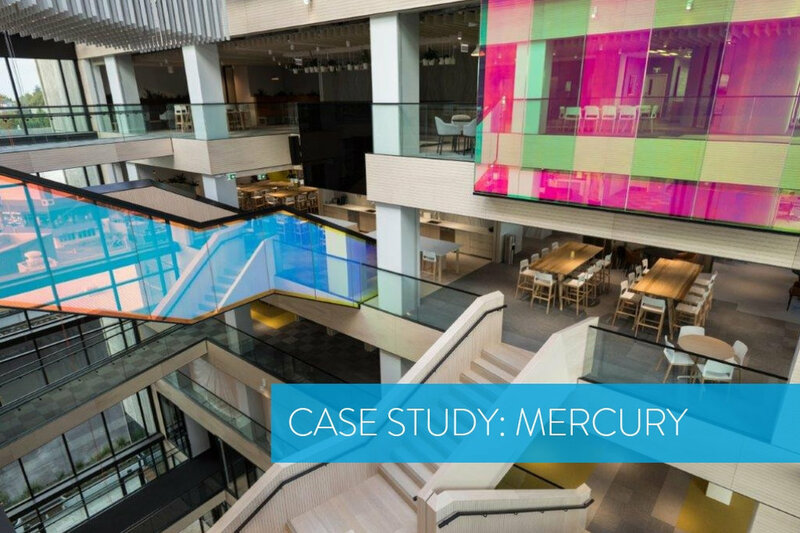 The company’s purpose is to help Kiwis enjoy energy in more wonderful ways, but first Mercury needed to bring some energy and wonder to the workplace. Mercury chose Warren and Mahoney Architects to create a dynamic, agile work environment, true to Mercury’s vision. Highlights of the building include the “pop-out boardroom” that juts out from the atrium, the raised floor, and the flowing open-plan workspace. The final stage of the process was the soft fit-out – installing workspace solutions to create the perfect collaborative, productive environment. Mercury, and Warren and Mahoney, knew what pieces they needed: sit-to-stand desks, break out spaces, private booths, and collaboration desks. And they wanted everything to be of the same exceptional standard as the rest of the build. After the RFP was sent out to selected suppliers, a specially appointed furniture committee was put together to represent the company and select the right supplier. In Caroline’s words, it was a “rigorous process” with meticulous criteria. Five companies were shortlisted, four showrooms were visited, and of the final two contenders, SmartSpace was chosen. Sheila Ye of SmartSpace believes their success in being awarded the job came down to several key factors. The solutions were exactly what Mercury was after, the communication was clear, the quotes weren’t complicated, and anything Mercury needed could be done. Because the SmartSpace factory is in Auckland, their workspace and technology solutions were cost-effective and could be made, customised, and reconfigured with ease. “Anything they needed customised specifically we could change internally,” says Sheila. This was especially important in the case of the lockers, made ready to use with Mercury staff swipe cards. The lockers required specific programming for Mercury’s high security, and with only a few months before the offices were due to open, this needed to happen fast. Other companies were based overseas and were unable to offer the same service or match the speed and price. As Warren and Mahoney’s Arron O’Hagan reflects, “SmartSpace were the ones who were always on time, and were able to go and make changes without any major hassle”. Several other challenges such as staggered access to floors, a few construction set-backs, and an install that had to take place over Christmas didn’t affect SmartSpace’s ability to perform. 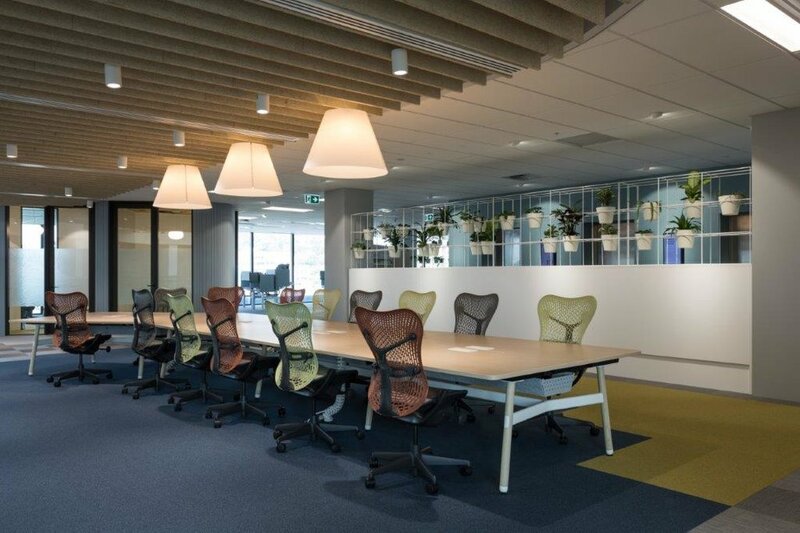 The final fit-out combines modern agile solutions to provide staff with many different ways of working – whether privately in a focus booth, or collaborating in one of the many breakout spaces and meeting tables. Each solution offers unique benefits. The bespoke 1200 long sit-to-stand desks make for an efficient use of space, meeting room tables are fitted with AV solutions, and the SmartaLock lockers are equipped with phone chargers and lights. Caroline and the rest of the Mercury team couldn’t be more pleased. Some of the staff members were nervous about the new style of working but the response to the new office has been incredibly positive. Every solution is being used – Caroline is yet to see an unused booth, and she’s thrilled to see staff collaborating more than ever before. Mercury has only occupied the new offices for a few months, but we feel that productivity will increase as a result of the new office and working environment. With plenty of space for growth, the future of the energy company is looking very bright. Special thanks to Arron O'Hagan and Holly Campbell from Warren and Mahoney, and Caroline Basham from Mercury.